Failure to invite President Vladimir Putin to 70th anniversary of Red Army's liberation of Nazi death camp stirs controversy, says Bryan MacDonald. Polls show that the Russian public is increasingly aggrieved by current international attitudes toward the country. As Russia is frozen out on numerous issues by western powers following last year's seizure by Moscow of the Crimea, something of a siege mentality is developing, with support for President Putin at unprecedented levels. The Auschwitz ‘snub’ to the Kremlin might be the biggest perceived insult yet. In January 1945, the Red Army’s Vasily Gromadsky arrived at the gates of Auschwitz and shouted to the prisoners: “You are free! Come out!” With that, perhaps the most gruesome chamber of horrors in human history was liberated. Now, in January 2015, the Polish government has failed to make an effort to invite the head of state of Russia, the USSR’s successor, to the 70th anniversary of the emancipation. Polish officials disingenuously say nobody was formally invited; each country was free to decide to participate or not. On Jan. 21, Polish Foreign Minister Grzegorz Schetyna said: “It was the Ukrainian front, First Ukrainian Front, and Ukrainians that liberated [ed: Auschwitz]; there were Ukrainian soldiers on that January day and they opened the camp’s gates, they set the camp free”. In response Russian Foreign Minister Sergei Lavrov told reporters: “I cannot even comment on this. It was the Red Army that liberated Auschwitz. 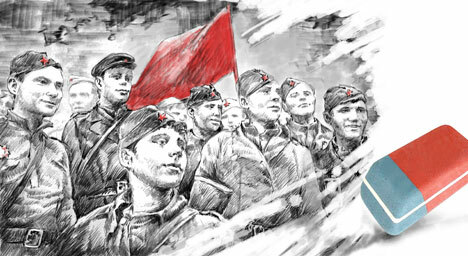 It [the Red Army] included Russians, Ukrainians, Chechens, Tatars, Georgians, etc. It is absolutely blasphemous and cynical to try to play with national feelings in this situation". What most European commentators don’t fully understand is just how all-consuming memories of the ‘Great Patriotic War’ are for Russia. Defeating German fascism and repelling the Nazi invasion is considered to be the nation’s greatest achievement. Some in the west may perceive Yuri Gargarin’s first space flight as the crowning glory, but the natives don’t. There's a simple reason for this, almost every Russian either has a living or dead relative who fought in the conflict. Not many Russians can boast of a family member who has been to outer space. The UK and, to a lesser degree, the USA also dwell heavily on the memory of World War Two. While both made huge contributions to the war effort, even the most myopic would not dare suggest that Britain's suffering was comparable to that the USSR endured. Total Soviet deaths number around 27 million. By comparison, Britain lost 450,000 and the USA 420,000. The main aggressor, Germany, counted around six million casualties. In 2004, Vadim Erlikam estimated that around 14 million of the Soviet fallen were from Russia with other massive losses sustained by Ukraine (6.8 million) and Belarus (2.3 million). The central Asian countries of Kazakhstan and Uzbekistan suffered greater loss of life than the UK or USA. Poland was also a victim of the war. In 1987, Dachau survivor Franciszek Proch, concluded that 3.3 million ethnic Polish and 2.5 million Polish Jews died. The leaders of Poland, Belarus, Russia, Ukraine and Israel should take first place in the Auschwitz memorial events. They are the contemporary representatives of the bulk of victims. The role of Germany’s President should be to atone for the wrongdoing of his predecessors. The rationale for not inviting Putin to Auschwitz appears to be the confrontation between Russia and western powers over the crisis in Ukraine. It may go much deeper. Efraim Zuroff, ‘Chief Nazi Hunter’ at the Simon Weisenthal Centre in Los Angeles, believes that, "ever since the admission of the Baltics and many other East European countries to the EU and NATO, we have witnessed a systematic campaign to undermine the uniqueness of the Holocaust and promote the canard of equivalency between Nazi and Communist crimes. “The motivation for this campaign is obvious, since in most Eastern European countries collaboration with the Nazis meant active participation in mass murder, and if given a choice between being branded as countries of perpetrators or victims, it is clear what the new democracies prefer. So instead of honestly confronting their bloody holocaust past, they opt to emphasise their own suffering under the Soviets and Communists and proceed to glorify freedom fighters against communism, even if they mass murdered Jews during the holocaust,” Zuroff said last week in a comment published by Israel’s i24 News. The problem for these historical revisionists is that Putin’s mere presence in Poland will serve to remind the world whose army liberated Auschwitz. At a time when Nazi collaborators such as Ukraine’s Stepan Bandera, Croatia’s Dinko Sakic and Latvia’s Viktors Arajs are being rehabilitated by extremists (in Bandera's case by the Ukrainian government) some in Europe wish to avoid focusing on the fact that Soviet Russia was the main force behind freeing Europe from fascism.